When he was five years old, the car he and his family were travelling in hit a landmine in South Sudan's northern town of Bentiu. His grandmother was killed. His left leg was shattered and had to be amputated. 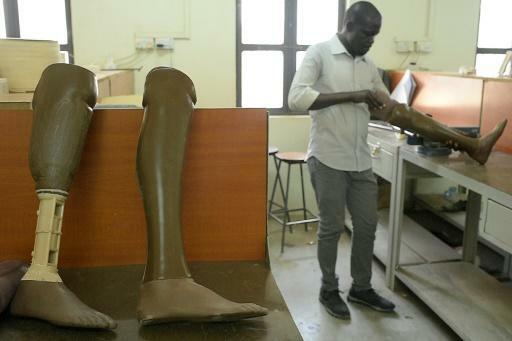 South Sudan's five-year-long civil war has left possibly tens of thousands of people without limbs -- a toll that may never be accurately established. Approximately 60 percent of the patients who come to the Juba centre -- one of three in the country -- have gunshot-related injuries and disabilities, according to the ICRC. Others became disabled by polio, rickets -- linked to malnutrition -- or other diseases that have been eliminated in so many other parts of the world. Other patients at the centre currently include a young man with severe scoliosis -- a curved spine -- who was being taken to school in a wheelbarrow until he was brought in to get a customised wheelchair.